Today I decided to cook a pasta dish, and I am thinking to make again our own pesto. I did it in the past, but it is really good if we just stop buying those ready made from the bottle and just doing our own ones. More fresh and healthy for sure! Well, definitely taste much better!!! To make our own pesto, you need a lot of green herbs, you can come up with your own combination, as long as you love the taste. If you would like to follow my version, here you go! I was using basil, two kind of parsley, the continental one and the curly one, coriander and garlic, I love spicy, so I would like to add red chilies, and I also love to add some parmesan cheese. You can omit the chili and cheese if you prefer not spicy, but I think the cheese touch is great. Then, add around 100ml olive oil and season with some salt and pepper, and some fresh squeezed lemon juice. That touch is more like a chimicurrri sauce, but I love the touch of acidity to keep it really fresh! Place everything in a food processor and blend everything together. Now you have your own pesto ready, you can store them in the fridge for a week if you could not finish it in one go. For the pasta, this time I bought something organic, from this Italian brand Tarall’Oro. It is Torchietti, but you can also cook with fussili or penne. Cook the pasta with the cooking time according to the package, on the other hand, get the vegetable ready. Heat up the pan with olive oil, and then put the sliced garlic and chopped onion into the pan. Sauté them until they start to turn soft, then add the chopped zucchini and yellow pepper into the pan, fry them until they turn brown. Place the halved cherry tomatoes into the pan one minute before the dish is done, fry quickly with the tomatoes, season with salt and switch off the fire I also love to add more chili but this is totally optional. 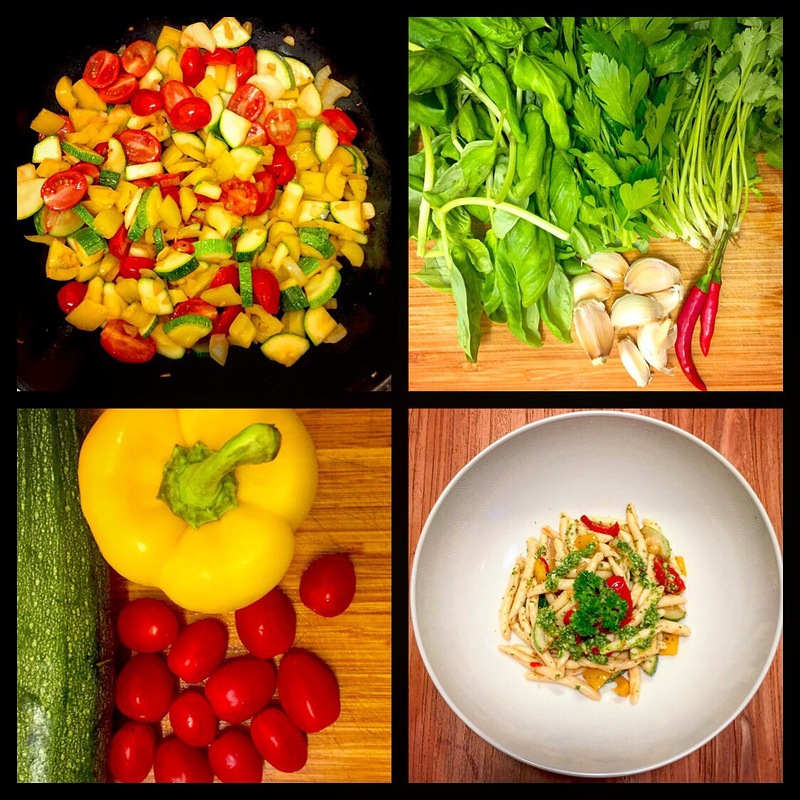 You can choose other vegetable, but I think it is very nice to have three bright colours in the dish, and these three ingredients go well together. When the pasta is ready, drain the water with the strainer and mix them well into the vegetables. Then add few tablespoons of pesto sauce into the pasta and keep mixing until you feel it’s enough. You can serve the pasta with some extra shredded cheese, and a touch more pesto. Garnish it with some parsley or basil. I think this is really yummy and fresh for Summer time! I’m missing spaghetti bolognese, haven’t cooked that for quite some time, so would love to make it for tonight. Funny though my husband is also craving for this dish, he is happy that I am cooking this tonight! I would like to make a spicy version tonight, both of us like how it tastes, a bit spicy! To cook the sauce, heat up the sauce pan with some olive oil, then add minced garlic. Add all the vegetables in, finely chopped onion, carrot, celery, and some red chilli pepper, cook them a bit, and then add the minced pork and beef. Cook it for a while, season it with thyme, oregano, salt and black pepper. Add some red wine and let it simmer for a while, then add plum tomatoes in. Let the sauce simmer and cook for around 15 to 20 minutes. Add water in between if you feel the sauce is too dry. Cook the spaghetti according to the package and mix them with the sauce when they are ready. Serve the pasta with shredded parmesan cheese and a bit of basil. We love the spicy version and it tastes better than the non-spicy one. There are few pasta dishes that are on my top list, linguine alle vongole, linguine al tonne piccante, spaghetti agile e olio, and etc. 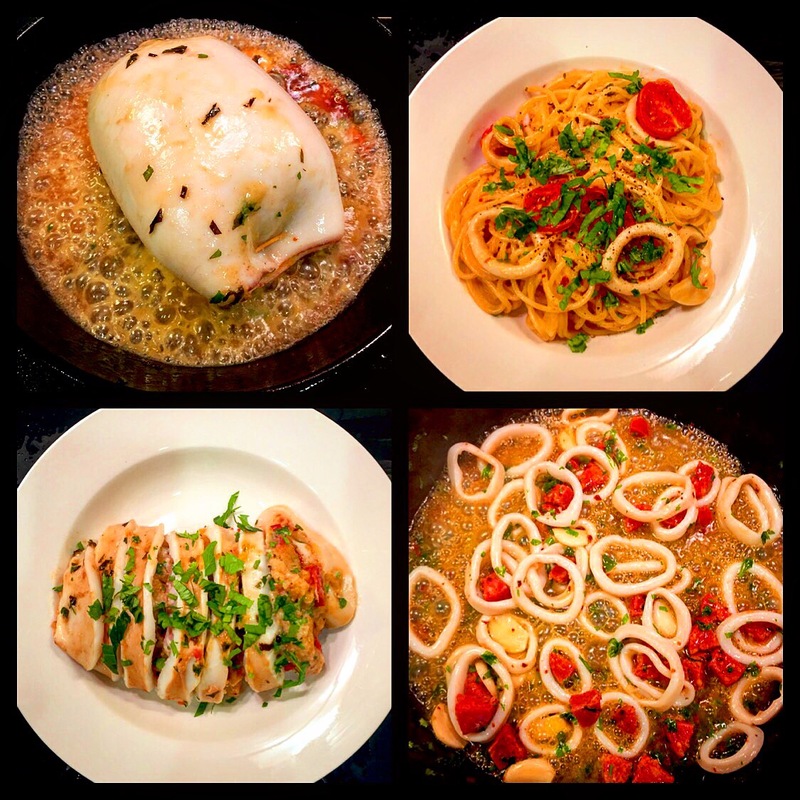 For spaghetti aglio e olio, usually I rely on my husband to make it, I actually have never been cooking this dish. The other day, I was missing this dish very much, why don’t I try to cook it by myself and see how does it taste. First of all, put the frozen shrimps in the pan and heat up the pan directly without adding any oil, let it cook until the shrimps turn slight pink. Do not overcook or fully cook them, just around 80% cook as we still have to cook them when the sauce is ready, just leave them aside at the moment. Try to get the spaghetti ready at the same time when the sauce is ready, that’s what you always have to look after, the pasta should be eaten at the moment when it’s ready, which is very important to Italian! Boil a big pot of hot water, season it with some salt and cook the spaghetti according to the cooking time on the package. For the sauce, heat up the pan with a good amount of butter and olive oil. I like to use some butter as everything taste better with butter! When the oil is hot, put minced garlic and finely chopped onion in the pan, fry until the onion turn a bit brown, then add a touch of white wine, and let it cook a bit. Make sure you have a good amount of oil, if you feel that you don’t, please add more olive oil in the pan as the sauce will be only based on the amount of olive oil. When it’s amount ready, add the chopped red chilli pepper, you can skip this if you don’t like spicy, then add the prawn and let them cook until they are done, season the sauce with salt and pepper. Finish it up with some more red chilli pepper flakes and finely chopped parsley. At the same time, the spaghetti should be ready, so drain the water and mix them well with the sauce. I went to bed very late on Saturday night, it so happened that I caught this TV show about David Rocco. I like to watch his show, as the way he cook is very simple, simple Italian food, just like home cooking. As he always says that he is an Italian, not a chef. All the dishes he made are very down to earth, and simply just about food. That episode of this show is about seafood, and he would like to break the rule of putting cheese in the seafood dish. I still remember back then, I used to work with Italian crew in New York. When we go out for dinner, I ordered a seafood dish and asking the waiter for some cheese, they all looked at me like, WHAAAAAATTTTT? “You NEVER put cheese with seafood, you will be killing the dish!!!! !” And I remember there is a poster on the wall at Da Silvano Restaurant in NYC, with a big bubble saying “WHAT??? Cheese with Seafood?? ?” something like that. So, I became very careful on putting cheese with seafood since then. David Rocco in the show was cooking two dishes with calamari and pecorino cheese, he said why not putting them together, as they taste good! I know seafood and cheese together is not tasting bad, but it’s more about what the Italian said somehow. Hearing that from an Italian, and said that they do that quite a lot especially around the South, I am happy to try it out. The stuffed calamari is actually very rich, make sure you have few people to share, otherwise will be tough to finish it by yourself. For the stuffing, mix breadcrumbs, chopped parsley, spicy salami cubes, pecorino cheese, parmesan cheese, salt and pepper in a large bowl, then add one egg to bind them together. Get a calamari tube ready, and stuff everything inside the tube, close both ends with a toothpick. Heat up the pan, put some olive oil, fry the garlic and parsley for a minute and then place the stuffed calamari in the pan. Fry each side for few minutes until it’s done, do not overcook the calamari, otherwise will become too chewy. 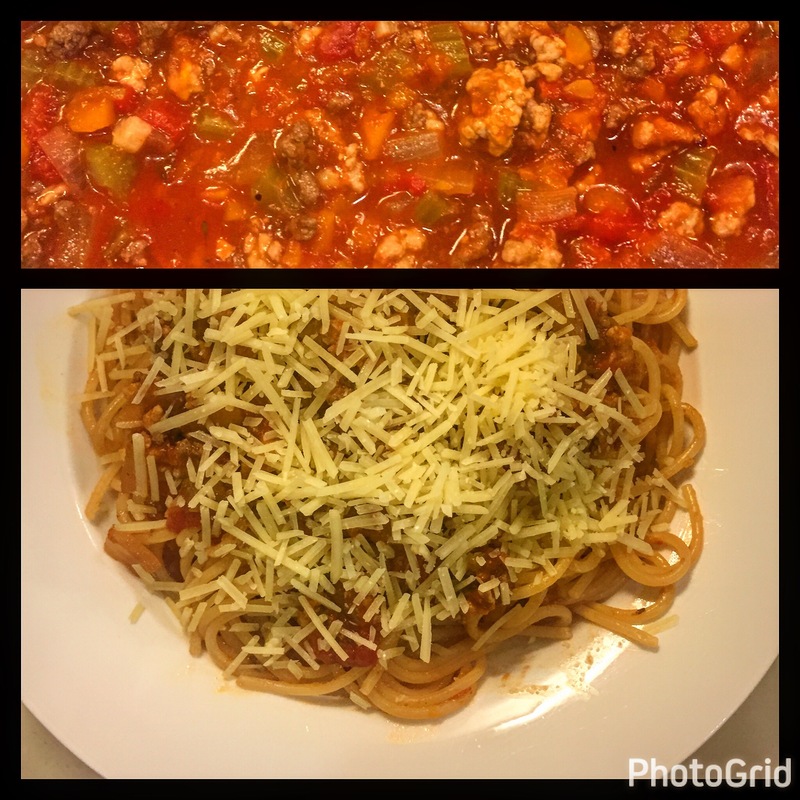 I used spaghetti for this dish and boil a pot of water for getting the spaghetti ready. On the other hand, get a sauce pan and heat it up, add olive oil, garlic and parsley in the pan and fry for a minute. You can add some red chili flakes if you like spicy, then add the calamari strips. Now add some salt, white wine or procescco in the pan, let it boil a bit, make sure there is enough sauce or otherwise might need to add olive oil. Meantime, crack two eggs in a bowl, add some black pepper, beat the egg and then add pecorino into the egg. When the pasta is ready, drain the water and then pour all the spaghetti into the sauce, and add the eggs into the pasta and the sauce, mix them well and ready to serve. Add some pasta water if you feel it’s too dry. Sometimes you just don’t feel to do much during Sunday, want to have a super easy evening, especially when I am still recovering from the flu. 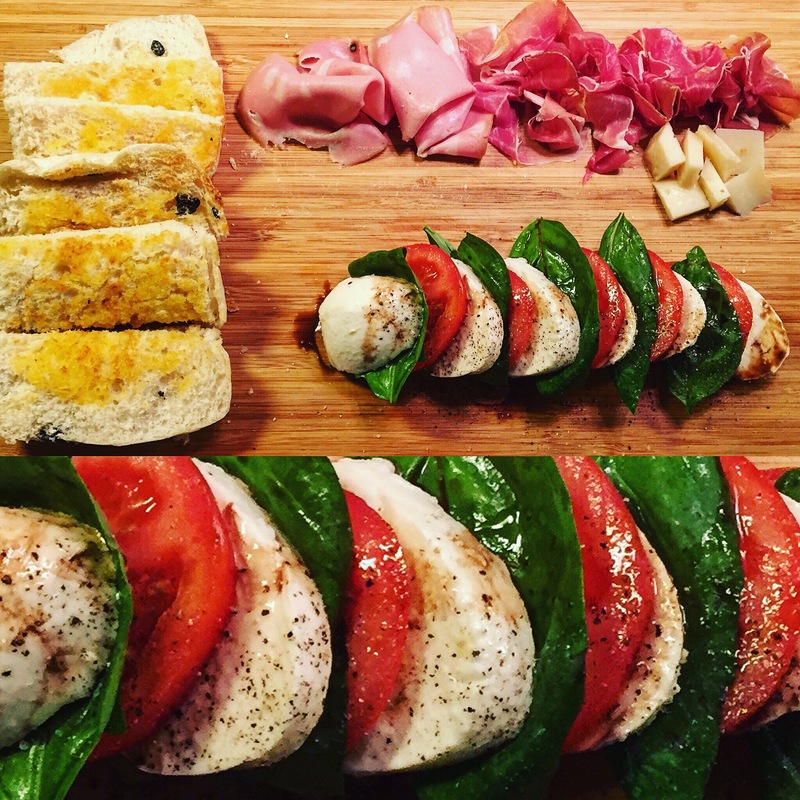 So, tonight I am fancy for an Italian cold cuts dinner, maybe can do also a caprese salad. There is a small Italian food store close to when I live, they have a great variety of cold cuts and cheese, and all kinds of Italian grocery. So, I bought ciabatta bread for myself and the rye bread for my husband. I also got salami, prosciutto, mortadella, fontina cheese, and I’ve also got some tomatoes, mozzarella and basil to do a simple caprese salad. On top of that, I bought 2 pieces of cheese cakes, but we were too full after dinner, so I guess we have to leave the cheese cake for tomorrow night. To do your caprese, just simply cut the tomato in slides, same thing for the mozzarella, and place them alternatively with a piece of basil as well. Make sure you eat a slide of tomato, mozzarella and basil together, that’s the way to eat. Season them with salt and pepper, as well as some olive oil and balsamic vinegar. Such a refreshing salad. Cold and rainy night again! What should we eat? Maybe something that can make you feel warm, creamy or cheesy…… Let’s do a creamy pasta, creamy smoked salmon penne pasta. This dish is creamy and you will feel satisfy after the meal! 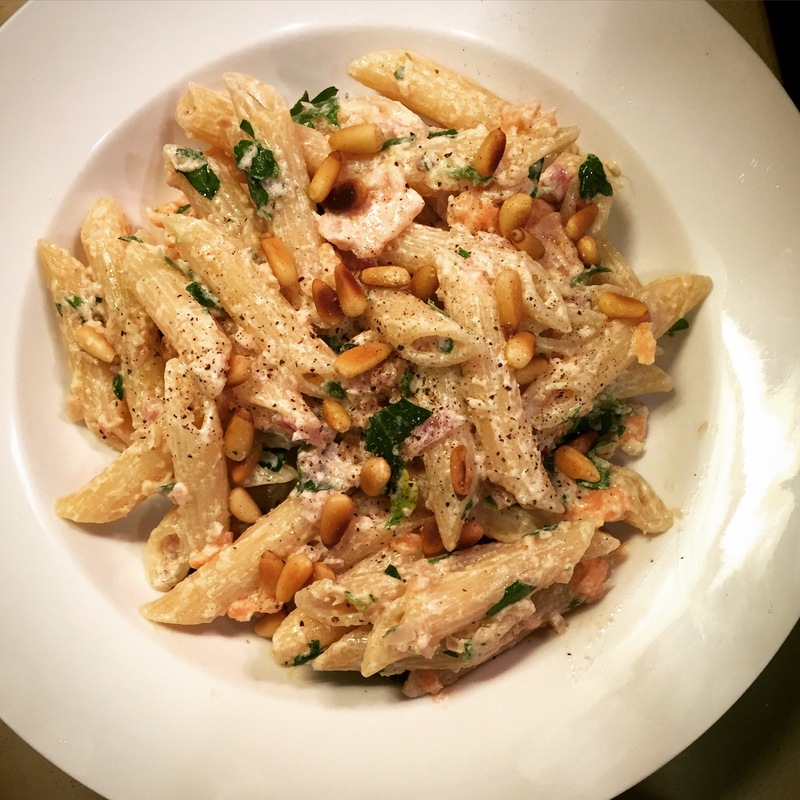 I love to add pine nuts for the pasta, love the taste and the consistency. First of all, before doing anything else, just fry the pine nuts with a pan with a bit of olive oil. You really have to watch it, because it might burnt all of a sudden, as you would not want your pasta with black pine nuts. So, that is ready and you will need that at the end, so better get it done in the beginning without spending time to cook it at the end. Some people just cook it together with the pasta, but I love to fry them a bit to get them taste even better! To cook the pasta sauce is quick, so you can almost cook the sauce and boil the water for the pasta at the same time. Boil a big pot of hot water for the pasta, on the other hand, get a sauce pan ready. Put some butter in the pan when it’s hot, place some chopped garlic and fry them until golden brown, you can also add some finely chopped onion if you like. Then, add the crème fraîche as you like, around 200 ml, add parmesan cheese or you can add any kind of goat cheese as well, depends on what do you like. Add a touch of freshly squeezed lemon juice, and a touch of white wine if you like. Cook until the sauce starts to become thick, season it with salt and pepper, then add the salmon. Do not add the salmon too early, as it’s already cooked, no need to extra cook them. At the same time, the penne or any selection of pasta you like, should be ready. The trick to cook the pasta is no tricks! Just pour a tea spoon of salt in the hot water and cook the pasta, duration refer to the cooking time on the package, and keep it with high heat, the result should be always good! Mix the pasta into the sauce, you can always save some hot water from the pasta, in case you need them if the sauce becomes too dry. Finally, put the pine nuts and chopped parsley and mix them well together, then served them with a touch of black pepper. Crème fraîche does taste different than a regular creme, but if you cannot find it, can still use the regular creme to cook the sauce. But, it tastes more creamy for sure with the crème fraîche. I have no idea how the time really flies, and maybe I really woke up too late… By the time I feel it’s about time to start the day, was already 5 o’clock in the afternoon. Was thinking to cook a big dinner as usual on Sunday, but I guess I cannot afford to do it today, still a lot to fix before dinner time. Therefore, I need to change my plan, and cook something simple for dinner. Pasta is something always so easy to cook, and so easy to please. The other day, I was already thinking about this dish, linguine alle vongole, which is my all time favourite, but I’ve never cook it. It’s difficult because you need to look for fresh clams, not cooking with those frozen ones. When I visit the wet market the other day, I saw them selling fresh seafood, that kind of reminds me, let’s cook this dish one day. Luckily, there are still clams available, but not the small one. These are bigger, but still OK. Let’s get the rest of the ingredients, parsley, cherry tomatoes, linguine, and that’s it. I have the rest at home, white wine, garlic and red chilies. 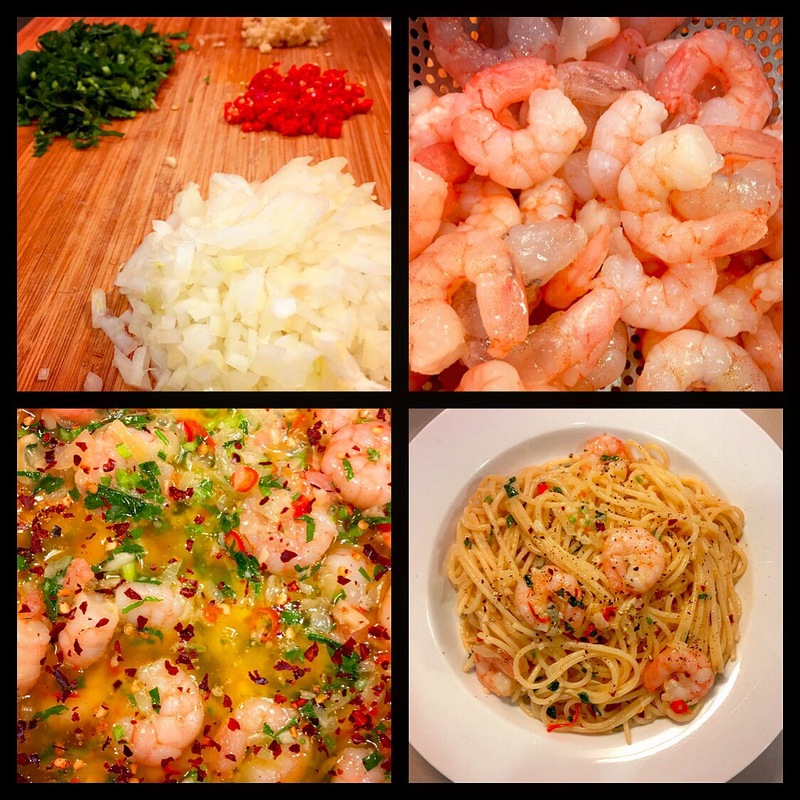 As usual, it’s all about timing, when you are handling seafood, plus you are cooking pasta, which should be served when it’s hot. This dish is all about time management! You need to make sure two things are ready at the same time, so that you can merge the pasta into the clams, then you can serve it right away. To cook this dish is super easy and simple, the only thing you need to watch out is just about timing. Of course if you only have one burner in the kitchen is not going to work, as you need two burners running at the same time. One side of the stove is getting a big pot of hot water ready for your linguine; the other side of the stove is heating up the sauce pan. Just simply heat up the sauce pan with olive oil, then add the garlic, parsley, red chilies and cherry tomatoes, when they are starting to cook, add the clams, and some white wine. Cover the lid and cook for few minutes, until the clams are open. By then, the linguine should be ready, and place them all into the sauce pan, and stir them well together with the clams, and it’s ready to be served. Very simple and yummy, just took half an hour from preparation to finish. Why don’t you try it out? Nice to pair with a glass of white wine.